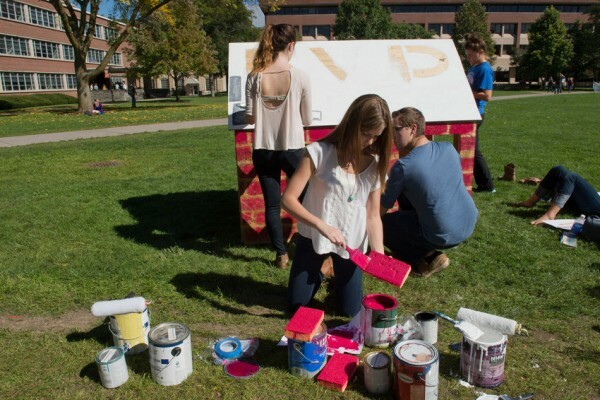 Students had only the basic of materials—wood frames, hammer and nails, and paint—to complete their shacks to help raise awareness about poverty housing in the United States and abroad. A wooden frame, a hammer and some nails, and cans of paint were basically all they had to work with. Just the essentials to construct a humble abode. Dozens of students erected rudimentary shelters in the Quad Wednesday afternoon for the Syracuse University/SUNY ESF Habitat for Humanity chapter’s Shack-A-Thon. Some students even stayed the night, using only plastic garbage bags to cover the bare windows. Eighteen student organizations, including sororities and fraternities, participated in the three-day Shack-A-Thon event that focuses on the state of poverty housing in this country and abroad. An opening ceremony was held Wednesday night in Hendricks Chapel with the CEO of Habitat for Humanity for New York State. The Quad was alive with the sound of hammers Wednesday as students built “shacks” as part of Shack-A-Thon events, which runs through Friday. Each organization that sponsored a shack was responsible for donating $300 to SU/ESF Habitat for Humanity, which funds projects through the local Habitat for Humanity. Danielle Benavides ’15, co-director for SU/ESF Habitat for Humanity, is inspired by the number of students and organizations, including fraternities and sororities, who were willing to sleep in the shacks on the Quad for two nights. “It shows that they care about being part of a good cause and spreading awareness about people who don’t have homes, or if they do, they live in extreme conditions,” Benavides says. The chapter members hope students will also consider being part of Habitat for Humanity and become involved in the community, helping on projects this year that will provide homes for a veteran and a woman and her family. Chapter members worked last semester on a home for an interfaith build with the local Habitat for Humanity. The SU/ESF chapter provided funds that helped finish construction on the West Side home for June Kimber and her children. 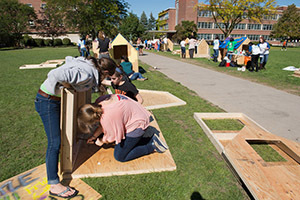 Students complete the finishing touches on one of the many “shacks” put together on the Quad Wednesday for Shack-A-Thon, hosted by the SU and SUNY ESF Habitat for Humanity chapter. Other events taking place as part of Shack-A-Thon Thursday include a scavenger hunt from 4 to 5 p.m.; a date auction with DJ Suarez from 7 to 8 p.m. in HBC Gifford Auditorium; and a movie screening of “This is the End” from 8-10:30 p.m. on the Quad, presented by University Union. 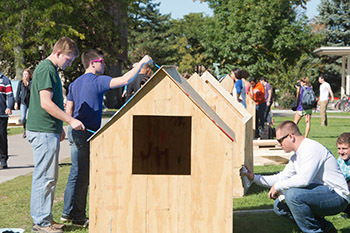 On Friday, Sept. 27, a Habitat for Humanity award ceremony will be held from noon-1 p.m. on the Quad. Gold, silver and bronze prizes for involvement during Shack-A-Thon will be handed out, Najam says.